Bring a large pot of water to a boil over high heat to cook the egg noodles. Once boiling, add some salt and the noodles and cook until al dente according to package directions. Drain thoroughly. While the water is coming up to a boil for the egg noodles, preheat a large skillet over medium-high heat and drizzle the pan with two turns of the pan with EVOO, about 2 tablespoons. Add the chicken pieces and brown on both side for about 4-5 minutes and remove to a plate. To the same large skillet over medium-high heat, add the carrots, onions, celery, garlic and bay leaf, season with some salt and pepper and cook, stirring every now and then for 3-4 minutes, until the veggies start to get tender. Scoot the veggies to the sides of the skillet and add the butter to the center of the skillet. Once the butter melts, add the flour, stir to combine and cook about 1 minute. Add the white wine, chicken stock and milk and whisk together. 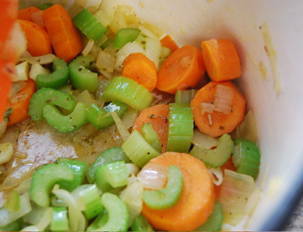 Stir in the veggies, bring up to a bubble and simmer for 3-4 minutes until thick. Remove the bay leaf and then add the peas, reserved chicken pieces, basil, parsley and drained noodles, and toss to combine. Transfer everything to a baking dish. In a bowl, mix together the bread crumbs and shredded Italian 3 cheese mix, sprinkle over the casserole and transfer to the oven. Bake for 15 minutes, until the top is brown. Serve with a simple green salad alongside. In Recipes-list.com we have selected the most viewed recipes from category - uncategorized . Enjoy the best recipes specially selected for you! Rachael’s “Fixed-Up” Chicken & Vegetable Casserole is the right choice that will satisfy all your claims.